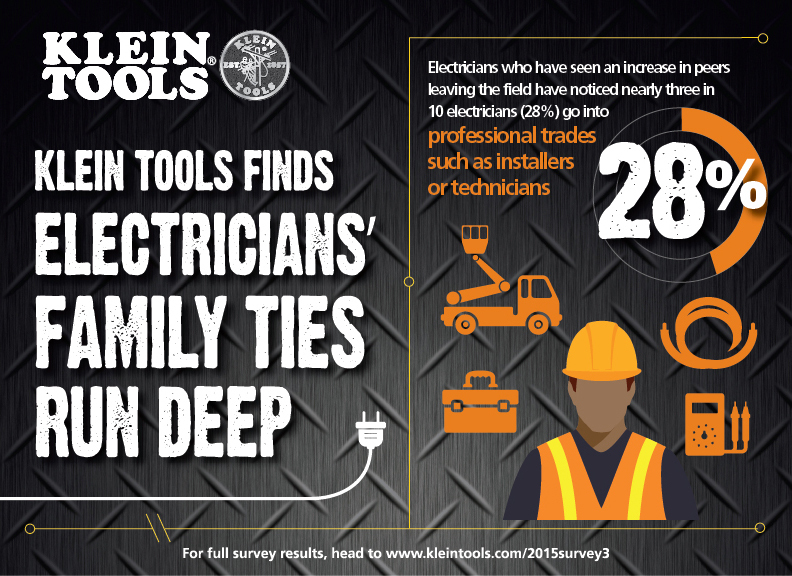 December 7, 2015 (Lincolnshire, IL) –Klein Tools (http://www.kleintools.com), for professionals since 1857, today announced 2015 takeaways from its inaugural State of the Industry survey. The survey examined hundreds of U.S. electricians’ concerns and future projections for the industry. The most notable findings include why electricians are entering and leaving the industry, as well as their preferred project work. Electricians continue to enter the field looking for a lifelong career. Over two-fifths of electricians (42%) entered the field because they thought it offered long-term security. More than one-third of electricians (35%) entered the field because they believed it is a field that is always in demand. 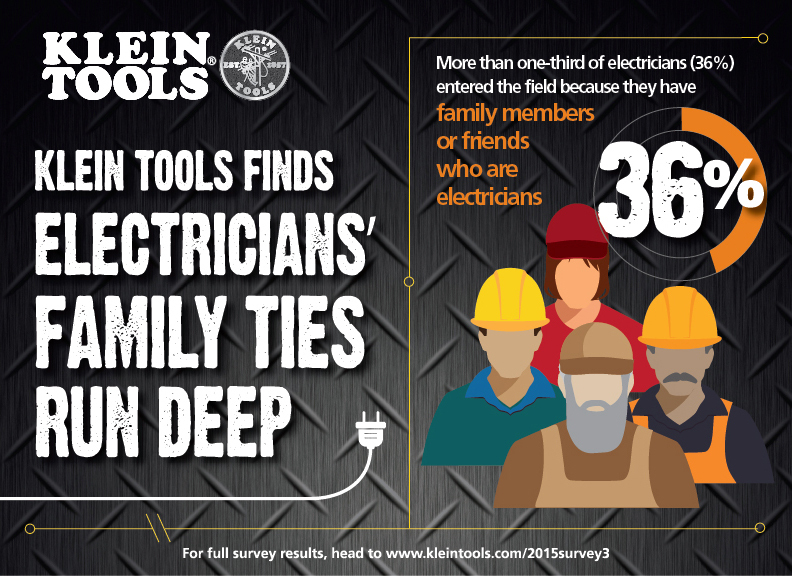 More than one-third of electricians (36%) entered the field because they have family members or friends who are electricians. Though electricians are entering for consistent reasons, many leave as they recognize a decline in available work or develop an interest in alternate trades. One-half of electricians (51%) who have seen an increase in electricians leaving the field cite less available work as a reason for pursuing other careers. Nearly three in 10 electricians (28%) go into professional trades such as installers or technicians. More than one-fifth electricians (22%) go into professional specialties such as computing/IT or engineering. One in five electricians (19%) goes into careers such as maintenance or construction. Preference in larger, more industrial projects is growing, as the country begins rebounding in new home construction. 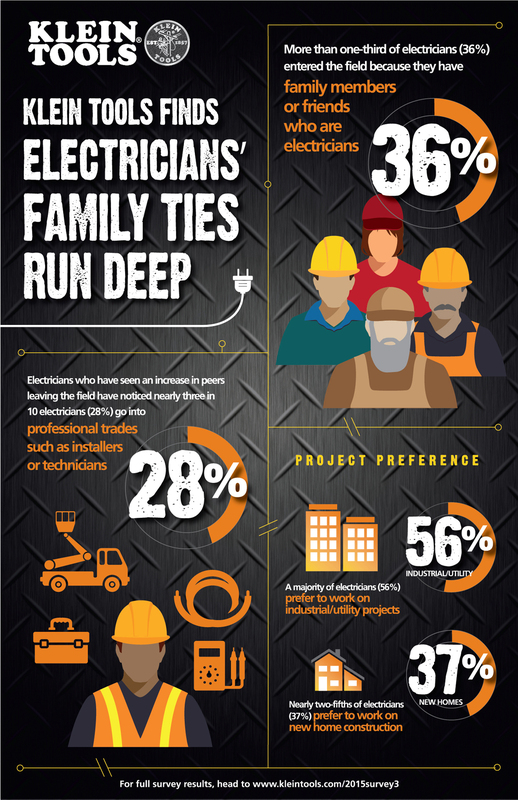 A majority of electricians (56%) prefer to work on industrial/utility projects. Nearly two-fifths of electricians (37%) prefer to work on new home construction. Electricians with 20 or more years work experience are significantly less likely to prefer working in new home construction (27%), compared to less experienced electricians (50% of those with less than 10 years of experience, and 44% of those with 10-19 years of experience). Klein Tools executives recognize these trends as a result of fewer available new construction projects from the recent economic downturn. They also foresee a shift in industry demand as construction needs and housing sales increase. This September, the U.S. Census Bureau released sales of new single-family houses have grown nearly 22 percent since last year. "The preference in industrial jobs over home construction stems from perceived job security," said Mark Klein, president of Klein Tools. "Electricians want projects that guarantee long spans of continuous work and increased opportunity for referral and additional contracting. We will see a shift back toward home construction as the 2016 building season takes off. 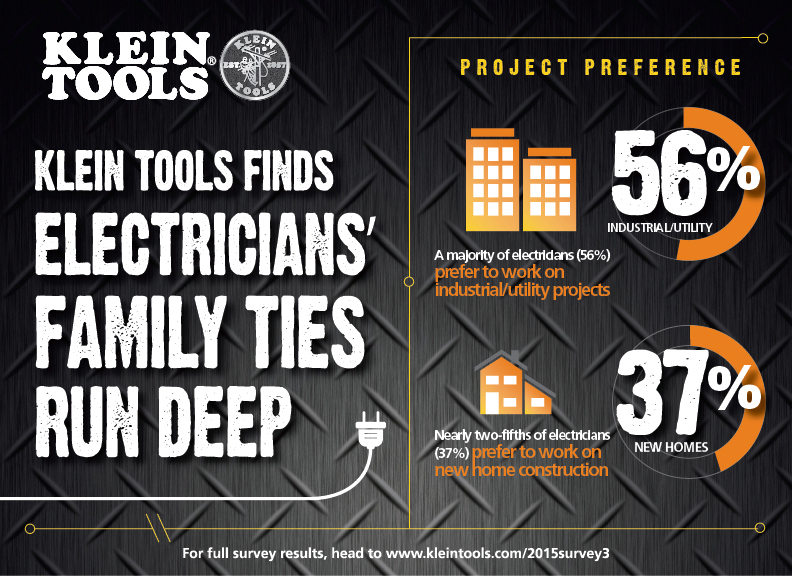 Klein Tools will be ready to help support and serve electricians on any of their job sites as we have done for 158-years." The Klein Tools ‘State of the Industry’ survey was conducted by Russell Research, an independent survey research firm, which conducted 201 online interviews from January 20 – 26, 2015 to secure a nationally significant representation. Forty percent of respondents were union members and 60 percent were not. An infographic visualizing these statistics is also available at www.kleintools.com/2015survey3.